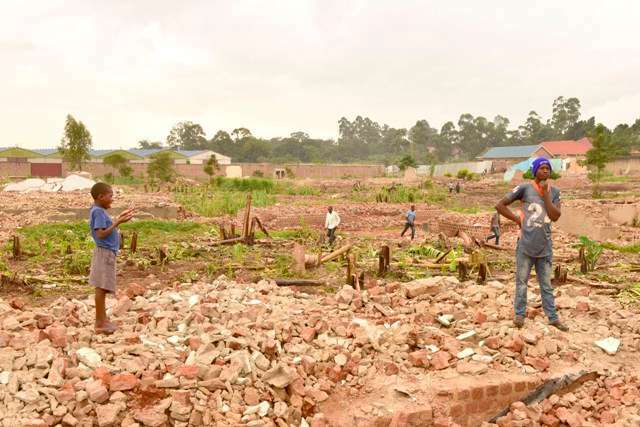 KAMPALA – The deputy registrar at the High Court land division Samuel Ekomor has declined to issue an interim order stopping residents of Lusanja, Wakiso District from reconstructing their houses that were demolished in October last year. The registrar stated that stopping the construction before visiting the land in dispute will cause tension. “There is a need to visit the disputed land and examining the circumstances surrounding it before issuing such an order,” Mr. Ekomor ruled. Businessman Medard Kiconco had applied to Court to issue an order stopping the ongoing construction on the disputed Lusanja land pending determination of the case he filed against 17 residents accusing them of trespass. Mr. Kiconco expressed dissatisfaction and vowed to fight up to the end. In another case 128 residents of Lusanja through their lawyers Luyimbazi Nalukoola and Abdullah Kiwanuka applied to be joined to the case filed by Kiconco saying they will be affected by its outcome. However, Mr. Kiconco through his lawyer Rashid Babu opposed the residents’ move saying they cannot force him to sue them. Court has set April 15 for the hearing of the application.